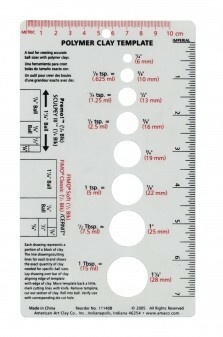 An easy-to-use tool for measuring lengths and circles when working with polymer clays. Take the guesswork out of measuring clay with this handy, easy-to-use template. It includes eight different diameter measurements for cutting circles or measuring balls, three drawings with cutting lines for the most popular polymer clays, and an 8" ruler.